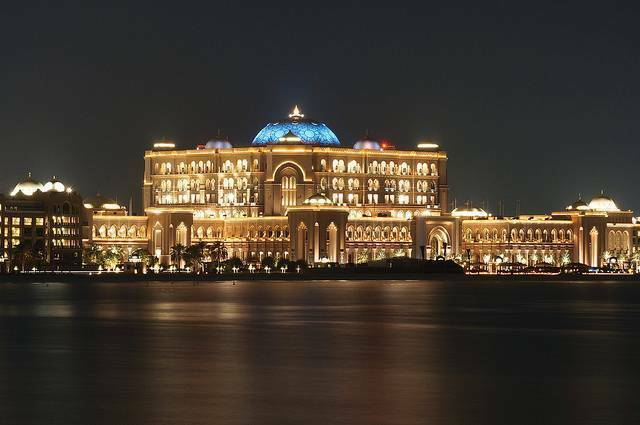 The Emirates Palace is not a palace (as one would guess from its name), but is a luxury hotel located in Abu Dhabi. This hotel showcases the Arabian Culture while offering world class facilities. It comprises of 394 rooms and suites and is located along a 1.3 km stretch of private beach. If this wasn’t enough, it has 85 hectares of gardens and lawns with 114 domes! (The main reason why it calls itself a palace instead of a hotel). Though the services offered here are beyond the 7 star hotel standards, yet this place falls under the 5 star hotel categories. It is a wonderful piece of architecture, spoiling you from the minute you step into the hotel. This hotel is perfectly maintained with sumptuous furniture and clean spacing. A striking thing about this hotel is the 24 carat gold plated ceilings and chandeliers. You have to see it to believe it! Traditional décor is mainly used mostly in gold, silver, marble and glass mosaics. Being a prestigious hotel, it is a popular place among the dignitaries and celebrities alike. The palatial restaurants offers world’s finest cuisines. The Emirates Palace is more than just a luxurious hotel. If you are someone who loves indulgence then don’t miss out on visiting this place.